Minergy is an emerging coal mining company committed to becoming the supplier of choice to all coal consumers across southern Africa and entering the seaborne thermal coal export market. Our mission is to leverage the significant product and logistics cost advantage over other producers supplying the target market to secure short and longer term coal sales. 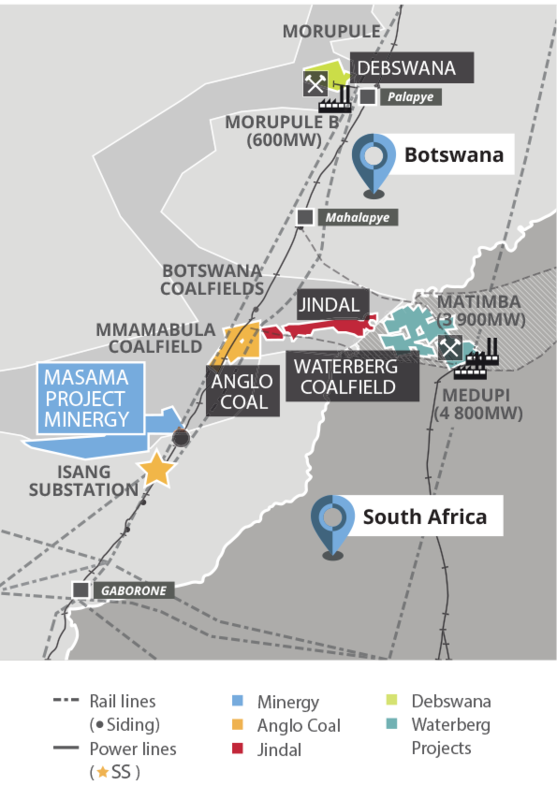 Minergy’s near term focus is the development of the Masama Coal Mine within the scope of the Prospecting Licence located on the south western edge of the Mmamabula Coalfield in southern Botswana. Minergy’s wholly owned subsidiary Minergy Coal holds the Prospecting Licence for Coal and Coal-Bed Methane, where a 380Mt Coal Resource has recently been independently delineated. 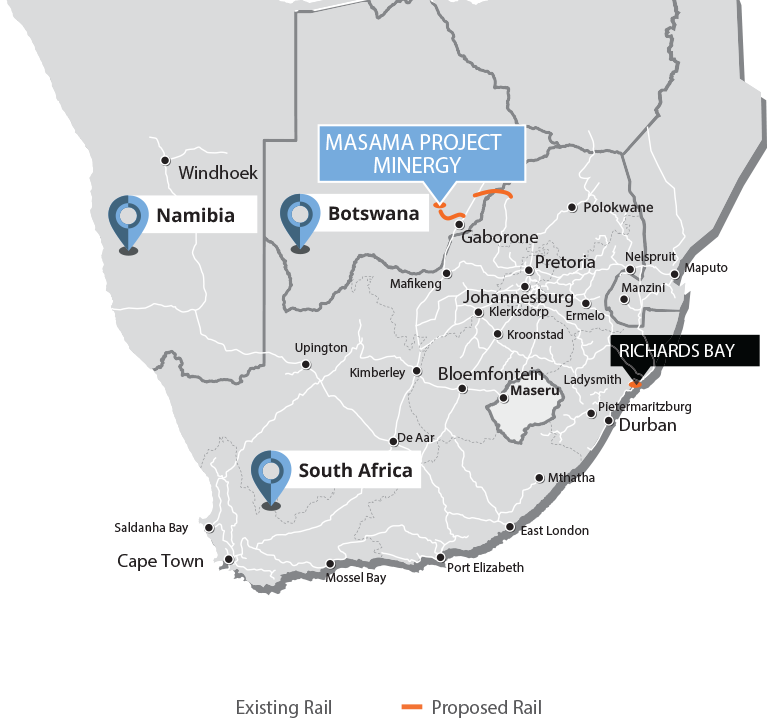 The Masama Project can reliably deliver a steady stream of coal product to the local, regional and international market places. A chartered accountant with an MDP from the University of Stellenbosch. A decade’s experience in the Botswana’s mining industry with senior management positions in companies such as Botswana Oil Ltd and Discovery Metals Ltd and effective 10 October 2017 took on the role of Managing Director of Cresta Marakanelo Ltd, a BSE listed hotel group. Mokwena was appointed to the Minergy board in January 2017. An accountant with more than two decades of experience in the South African coal industry. He founded South African focused coal trading company Chandler Coal (Pty) Ltd in 1997 following a successful executive management career in various industries. In 2005 after a period of exponential growth the company was listed on the Johannesburg Stock Exchange (JSE) as Wescoal Holdings Limited, enabling a transition from purely coal trading activities to a fully-fledged coal miner and trader. Wescoal , with three fully operational mines, is now one of the leading junior coal mining and trading companies in southern Africa. Andre was appointed to the Board of Directors of Minergy in January 2017 and its Chief Executive Officer in February 2017. A chartered accountant with an MBA from Heriott Watt University Edinburgh, Scotland. Extensive experience in the mining industry having been Chief Financial Officer of several groups including contract mining and beneficiation service provider Genet SA, junior coal miner Umcebo Mining Group, and Johannesburg Stock Exchange listed junior coal miner Wescoal Holdings limited. Morne was appointed to the Board of Directors of Minergy in January 2017 and as its Chief Financial Officer in February 2017. A lawyer and entrepreneur with over a decade and a half of experience in the international mining industry focusing on Africa. Senior management positions previously held with private & public companies including Platmin (now Sedibelo Platinum). Leading roles in significant equity raisings through private & public placements globally and stock exchange listings in several jurisdictions. Co-founding member of Minergy. Leutlwetse received his accounting qualifications from the University of Botswana and Association of Chartered Certified Accountants. He is experienced in Botswana’s capital markets having worked with one of Botswana’s leading broking firms.